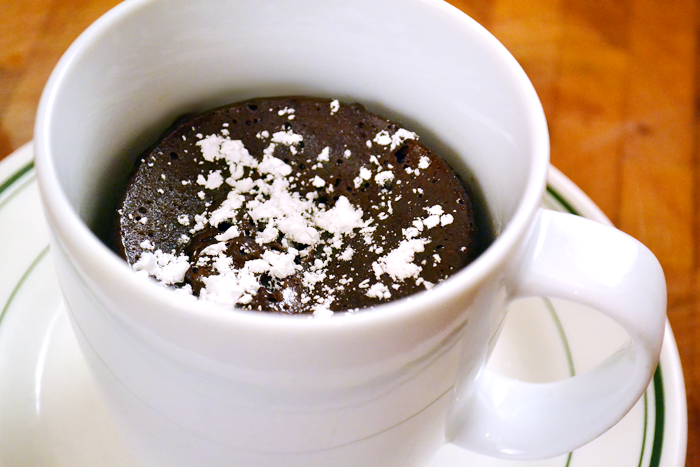 Chocolate Cake in a Cup...Who Knew?! I found myself in a conversation this week involving making meals in a mug. Yes, meals in a mug. Is that a thing? Yes it's a thing, check it out here! It fascinated me, and left me wanting to try it. I thumbed through the recipes, and decided to start with Chocolate Cake in a Cup. 'Cause, I love chocolate cake...so why not? Since I had most of these in the kitchen already, this seemed pretty doable. In a mixing bowl, mix flour, sugar, cocoa powder, and salt. Then, add milk, butter, eggs, and vanilla. I just stirred them with a wooden spoon. Fold in chocolate chips. Divide batter between 2 microwave-safe cups, then sprinkle the tops with more chocolate chips. Microwave both cups at the same time on high for 2 minutes (I actually microwaved for 2 minutes 15 seconds). The cake will rise up, and then settle back down as it cools. The cakes should be cooked, but very moist, and a bit gooey in the middle. You'll want to allow cakes to cool for about 15 minutes before eating. Sprinkle with powdered sugar. Straight up, it was good. That said, it doesn't have the consistency of cake. The kids and I had a long analysis of it, and decided it tastes more like a brownie. Was it yummy...yes. Did the kiddos enjoy it...you bet! Let me know if you give it a try! We're going to try Chocolate Fudge S'mores Cakes next! oh i am SO trying this recipe!!! Curious to hear what you think. Let me know how it goes! Awesome! You got the shot! Loved hearing you at BBC.